Blue skies and sunny days make for beautiful luncheons outside! I love to photograph outdoors, you can't beat natural daylight for great pictures! It's finally making it's official debut ! I love all the colors! All my faves! I recently found these fantastic dessert plates at a roadside flea market that I just couldn't pass up. They are from Villeroy & Boch, manufactured in Luxembourg, pattern: Acapulco. I love the pattern, birds, and of course the color! Don't they just make you happy? I was having more vinyl number fun...June 1 is my birthday, I decided to throw in a subtle birthday theme! Blue goblets, that my dear friend Judy gave to me, love them! Citrus and hydrangea centerpiece, super simple. The lemons and oranges are in a recent Goodwill find. The vase that the hydrangeas are in, is also Goodwill find that I spray painted Pumpkin Orange (Krylon). It was a not so hot color to begin with, but looks great in orange! Thanks for stopping by! I hope you are inspired! If you would like to view additional photos of this table scape, check out my photo stream on Flickr! michelle! first of all- happy birthday! secondly, i really LOVE your table setting. love the funky plates you used, and the colors are fantastic. i need to make a runner like that- so fun! it really looks incredible. Happy Birthday, Michelle! Every birthday should be celebrated for at least a week! :) I love your glass vases with numbers. What a great idea for your birthday decorations. Your plates were a great find. Lucky YOU! Happy, happy birthday, Michelle! What a pretty tablescape! What I *really* like are the sticky birthday numbers on the bottles. Most excellent. I will be doing this from now on! Won't mama think it's fun to see little blossoms poking out of bottles that are sporting, 1921 . . ! Happy Birthday, Michelle! What a beautiful table and I love how those dishes pick up your runner colors. Your pictures look great, too. What cheerful, happy colors. Great runner! Happy birthday, Michelle! I love this tablescape. And I would definitely have snapped up those fun plates, myself. I'm always on the search for bottles, are yours from something/somewhere specific? I hope you have a great vacation! Such a colorful table! Those plates are adorable! I love everything! Happy birthday!Oh my goodness..I'm loving this entire post, especially the pictures. Love the colors, the plates, the runner! I am so in love with this tablescape. Your runner is fabulous and I could not have passed up those plates either. Really fun and colorful. Perfect! Love it. The brightness, the ruffles, it's really fun and cheery! Thanks for linking up at RE today Michelle. And Happy Birthday! Happy Birthday...what beautiful cheerful photos! love the 1972 bottles...that's my year too. Happy birthday, Michelle! You and my daughter share the same birthday, she's only 16 but her style is alot like yours. We'll be borrowing your numbered bottle idea for her Sweet 16 party coming up in a few weeks! As always, thanks for the wonderful inspiration, and I hope you enjoy your vacation. OH my gosh can it get it better? This is the best one yet! I love how your tablecloth turned out! The dishes are spectacular!! Great photos! I cannot get over how much I love the vinyl on the bottles!! 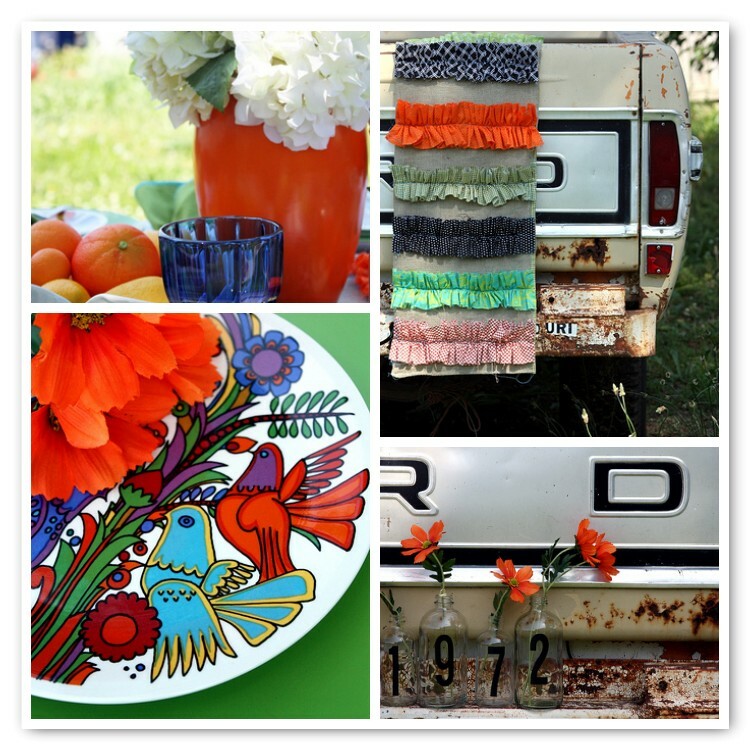 Please come link up to my Centerpiece Wednesday party and share these ideas!! Love it all!! Happy Birthday!!! Your photos are just flat awesome...Great Job!! You really do amaze me with how everything just flows! The colors all look so good together. So fun! What a great find...lovely tablescape. I absolutely LOVE your ideas for this tablescape. In fact I loved it so much I had to share it with all my FB and Twitter fans. Thanks for the great inspiration. Oh my goodness love love love this tablescape. It's going into my favorites file. I have artwork from Mexico that is very similar to the plates. So much fun. Thanks for the inspiration. Oh what a great idea for the birthday centerpiece! Love it. Happy birthday. The color in your scape is just so happy. Great plates to work with! A very happy belated birthday, to you, Michelle! 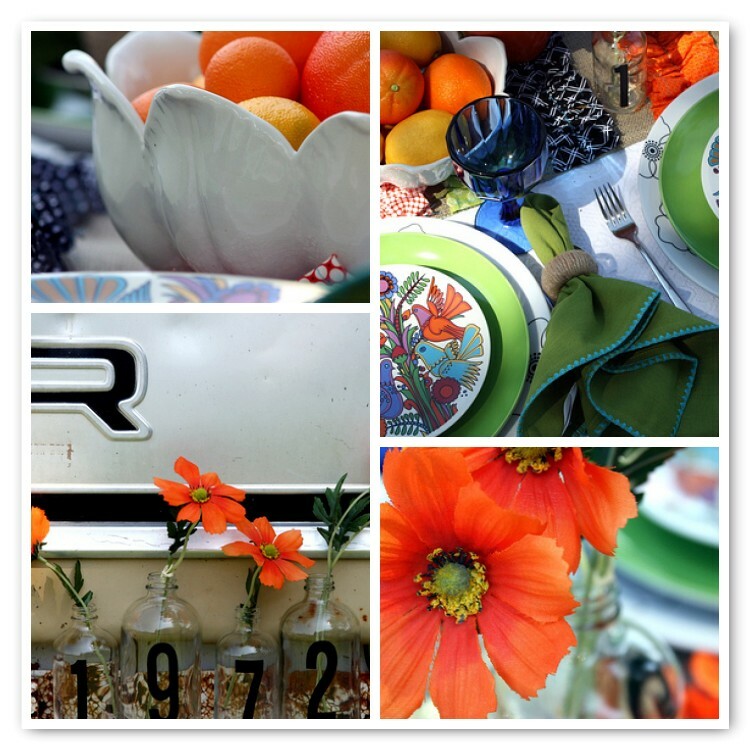 Your table is so bright and cheery, love those colorful little plates, they look wonderful on the green! Happy Birthday! Your photos look like a magazine spread. Very cool and creative. Love the burlap runner. Come by my blog and win a $50 CSN gift certificate and buy yourself a birthday present! Happy Birthday - what a colorful and creative tablescape. You certainly have an eye for color and mixing patterns. Wow! what a bright, colorful tablescape. Perfect for summer dining. A very fun setting. Michelle, a belated "Happy Birthday" & a round of applause for this wonderfully happy & colorful post! I never think to put blue & orange together but every time I see it, I just ♥ it!! Vibrant photos really bring your things to life. I'm your newest follower, although you've been on my google reader for a long time! Thanks for sharing your wonderfully creative talents. What a beautiful tablescape - I just love all of the details! The vinyl numbers on the bottles is my favorite! Happy Birthday! It is so cute!!! And I love those bottles with the numbers. Beautiful! That is just gorgeous! Love the orange and blue together. How creative you are!